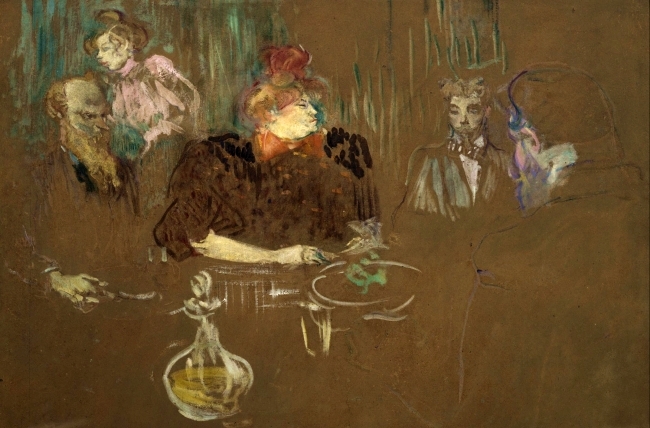 “At the Table of M. and Mme Natanson,” oil on panel, by Henri de Toulouse-Lautrec, 1898. Had a liaison with Mr. Basilewski, residing at 59, Saint Peter Street, who had been involved with Mrs. Ferrari, to whom he had left a considerable sum. Upon entering the theater, had an affair with young Mr. Konor, who had won $40,000 in a single evening of gambling and left her a quarter of that sum before returning to his duties at Fort Polk. Was involved with Mr. Chabrillant, who gave her $300 to $400 a month. Then again with Mr. Basilewski, who is said to have sacrificed for her a large part of his wealth. It is also rumored that she had an affair with Maurice, the horse trader of Rampart Street; that the two were genuine lovers and that he gave him riding lessons in exchange of her services. For a while, [the actress] was without a lover (November and December 1875), but she received almost every day the visit of a very young man, elegantly dressed, who stayed with her all afternoon until she went horseback riding in the park, to which he rarely accompanied her. She also received the visit of another young man, a bit older than the former, who arrived in a two horse carriage. 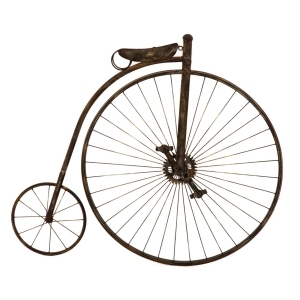 His coachman wore a white livery, but his visits were less frequent. Seems subject to gloomy tendencies. Is reported to keep in her home a rosewood coffin, padded with white silk, inside which she sometimes sleeps. Also said to possess a human skull which she displays on a silver platter when entertaining guests. Is said to commonly wear on her person a brooch set with a miniature skull which she calls Sophie. Lives at 2 Burgundy Street, but will soon relocate to Bourbon Street. Is said to possess draperies representing tears and skulls, which she intends to have installed in her new residence. Is a regular of lounge number 6 of the Golden House. During the month of June, was in said lounge with one of her friends, Mrs. de Joya, of Italian origins, when they received the visit of Mr. Massena, Prince Robertskoff, and a Mr. Gautray. Owns 5 horses and 3 carriages. Is said to be very good to her household staff; allows the lovers of her male and female servants to have meals with them in the kitchen. Therefore has considerable household expenses. On the 27th of this month, Mr. Gautray, residing at 10 Toulouse Street, visited [the actress] at her residence on 4 Burgundy Street. He had intimate relations with her and left her $100 for her services. Mr. Gautray is said to be a close friend of the Laffitte family. Mr. Henri Ducasse, previously mentioned in this report, again had intimate relations with [the actress], last Saturday. This time, he visited in her residence at 4 Burgundy Street and gave her $50 for her services. Mr. Henri Ducasse left for Baton Rouge last Saturday. Before his departure, he had intimate relations with [the actress] and in addition to the usual sum, he gave her a pair of diamond earrings of considerable value. He should be absent but eight to ten days and promised that he would visit [the actress] again upon his return. Senator Henri Ducasse, who has been mentioned various times in this report, visited yesterday a well-known madam, to whom he declared that he was putting an end to his relations with [the actress], having surprised her with Mr. Remusat, his colleague in the State Senate, and also with Mr. Gautray, residing at 10 Toulouse Street. That when he arrived at the residence of [the actress] on 4 Burgundy Street, he sometimes had to wait in the anteroom until one or the other of these gentlemen left the premises, and that he was tired of having to put on such a show for a woman to whom he had given over $3000 in the past three months. He added that he did not understand how [the actress] accepted the company of such old men. It is to be noted that Senator Ducasse is himself quite old, as well as disabled, being partially paralyzed on the left side of his body. [The actress] attended the funeral of Mr. Basilewski. The cause of death is believed to have been tuberculosis. Death of [the actress], of tuberculosis. Her funeral was attended by Senators Ducasse, Remusat, and Gallifet; Congressmen Kenner, Barrot, Augustin, de Marigny, and Labranche; Messrs. Gautray, Chabrillant, Percy, Laville, and Konor; and a number of representatives from the theater, equestrian, and nocturnal professions. Antoine Bargel is a translator of fiction in English and French, and mixes a mean Martini. References at antoinebargel.com.